Tell your best anti-joke this fourm will work best if others use reply to feed off others so they can say their joke or they can just do a play type diolouge do what you prefer. PS: Anti-Jokes are supposed to be random and most are kind of lame the funniness is in the aquwardness that follows the joke so plz don't think of these as real Jokes they are ANTI-JOKES!!! A Really Bad DayThere was this guy at a bar, just looking at his drink. He stays like that for half of an hour. Guys...I introduce to you Anti-Joke Chicken. 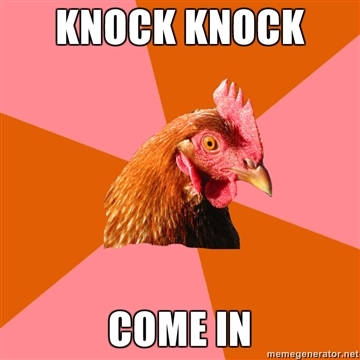 (2012-01-31, 01:29 AM)Nightcore Wrote: Guys...I introduce to you Anti-Joke Chicken. The horse then proceeds to snort and kick over several tables, since horses can't talk, so it couldn't reply, and the bar was a strange environment for it. Anti jokes are quite boring as they lack humor though sometimes find it interesting. I was expecting the chicken. GJ Nighcore. So two men walk into a bar. They had a casual conversation until they both decided to go back home. No...seriously,why're you looking at this? what did the chicken say to the dog? He got hit with a bus. whats big,red,and looks like a bucket? Whats blue,but smells like red paint? What happened when Chuck Norris kicked a man on the face? The man got hurt and ran away. what happened when rammus bumped on a minion instead of an enemy champion? Random Guy 1: What would you do if you were swallowed by a huge frog? Random Guy 2: I would be dead. Its stomach acids would have melted me and stuff. The ProGamer are despairing and come to me. I am always asked by all this people, how I can manage it, to recognize in the online games an camper who makes a trap. I always tell this people the same: Because of his tent. Why can't a dog fly? : Because a cat can't it also.